We’re a little over two months away from Mario Tennis Aces’ first birthday, but the updates still aren’t slowing – and Nintendo’s latest offering, cannily titled version 3.0, is a little larger than normal, introducing new modes and more. 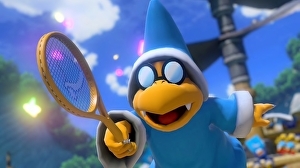 Mario Tennis Aces’ 3.0 update brings a broad variety of adjustments and additions, with the first notable inclusion being the new Ring Shot mode – where players attempt to secure a high score by aiming their balls through the variously sized rings that appear on-court while maintaining their rally. This comes in three flavours, each playable either competitively or co-operatively: Ring Shot Singles, Ring Shot Doubles, and Yoshi’s Ring Shot. The first two variants can be played on every court with all hazards active, and Nintendo notes that further hazards have also been incorporated.